Should we ALL be taking Lithium? I read an article in the New York Times over the weekend entitled, Should We All Take a Bit of Lithium? – and for the title alone, I just knew I had to share it with you! The basic premise of the article is this: Researchers discovered that areas where the water supply contained natural levels of lithium, the depression and suicide rates were much lower than areas where the levels of lithium in the water were much lower or non-existent. Lithium was found to significantly lower suicide rates, and had a significant effect in lowering rates of dementia! Lithium is a powerful mineral and none of us should be without it – even for one day! Signs of lithium deficiency include behavioral problems, depression, alcohol cravings, manic depression, impotency, dementia and severe/prolonged melancholia. Did you know that in the early days of 7up (originally called, Bib-Label Lithiated Lemon-Lime Soda), the soft drink contained lithium? It wasn’t for depression either – it was for helping manage headaches – and 7up soon became the drink of choice for hang over sufferers! 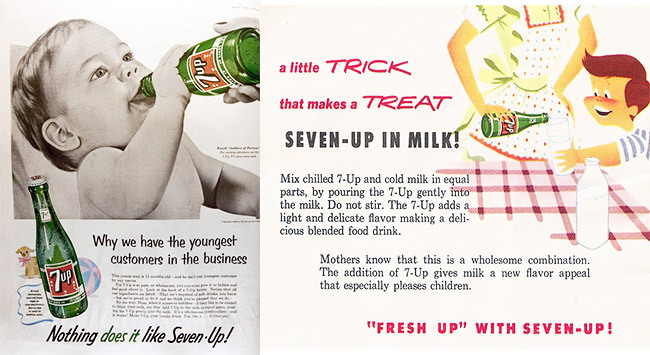 7-up actually advertised for a season for young mothers to add the soft drink to their babies milk to keep them ‘calm’ – or just tip the bottle right to your babies lips for maximum effect! As you know, I believe minerals are the foundation of health and wholeness, and we have build our Body as Doctor philosophy entirely upon the amazing, life altering benefits of using minerals, especially ionic minerals. So today, I’m sending you the gift of an amazing New York Times article, along with my recommendations if you or a loved one are battling anxiety or depression. 1. If you are suffering from depression or anxiety, you need to go off ALL dairy and meat from cows! Remember Mad Cow Disease? It’s still around. Eat more fruits and vegetables and focus on healthy sources of protein. 2. Make sure you walk, run or bike for 30 – 60 minutes every morning. You brain needs oxygen! Have you heard of “runner’s high”? This means the exercise is turning on your Serotonin factory, the crucial chemical ESSENTIAL for the brain to be happy. 3. Start with diet and exercise, and add one or more of our anti-depression formulas that can take the edge off, while you deal with the underlying issues driving your emotional state. We have an entire brain and mood category of extraordinary formulas designed to give you the emotional, psychological and mental boost needed so that you can overcome whatever is coming against you. Our ‘liquid lithium’ formula, Life Transfusion Liquid Mineral Complex, is definitely the place to start! Lithium is a natural anti-depressant, and magnesium can calm anxiety better than any pharmaceutical drug! IN CONCLUSION: Whether you want to use preventative measures to avoid depression throughout life, or are struggling now with depression and anxiety due to emotional or physical triggers, we can help! Call our customer support team and find out which formulas are right for you. Or if you need to talk, please schedule a consultation with me or one of my team – We are all here to help you. Previous PostPrevious USA TODAY – "10 states report outbreak of respiratory illness in kids"